I asked a few weeks ago to step down from the Funky Fairy Design Team to spend more time on my own designs. Funky Fairy Papercrafts is really growing which I am thrilled at but I need to focus more on my own business so I've regretfully stepped down as of tomorrow, 31st July. I know Shaz has had several people applying to be on the DT following Lou's well-deserved promotion to co-designer so I don't feel guilty at creating another place. 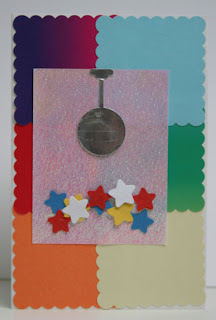 If you hop on over to the Inspirations Blog you can also see how fabby the materials are there and there are links to the shop and to Shaz and the DT members' blogs. They will be announcing the new DT members on 1st August and you can also see sneak peaks of the new stamps and get info on pre-orders. I wish Shaz and the team the best of luck as they build on recent success and I hope stepping down will give me more time to concentrate on developing my designs so that I will soon be looking for a DT of my own. Sheetloads of Christmas in July ! Voila mes cartes pour le challenge sketch de « Sheetload of Cards » et le sujet ‘Noël en juillet’ donc j’ai commencé mes cartes de Noël bien tôt ! J’ai utilisé des dessins de le CD Kerudoc Création ‘Hiver’ qui j’ai imprimé sur papier et acétate. Quel couleur vous préférez ? 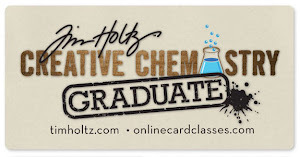 Last month I discovered a great ezine 'Sheetload of Cards' blog and when I downloaded this month's it just demanded I do something with it and in fact I did 2 things which are unusual for me: 1. I printed the whole thing off and had it sitting on the desk instead of just being saved on disk to maybe look at later (great designs in there); 2. I made Christmas cards before November ! I usually find it hard to create out of season but wow did I make sheetloads! I printed off several papers and toppers and just mixed and matched to the same sketch adding ribbons and gems, inking edges, etc as I went. 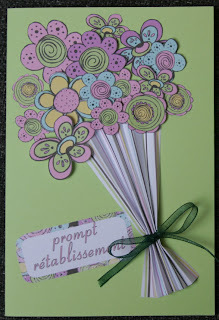 No waste bits of paper and lots and lots of cards...Which is your favourite colourway? I really like the soft Lilac : and the Teal (love the velvet ribbon too) and a few more mixing colours and patterns: My husband likes the organza ribbon over the paper in the one above, and here's an acetate version: and then I looked at the mini version ezine this month and made one of those too! All papers and toppers from Kerudoc Création Winter Collection; HOTP Icy rainbow ribbons colour match perfectly, as do Brilliance pearlescent inks in SkyBlue and Purple. 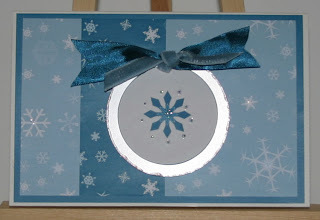 Also used ribbons and card from stash, Papermania snowflake brads and adhesive gems, Silver ink pad, cuttlebug embossing, Holographic glitterglue. Last week was a strange one: We've got such a lot going on with being about to finally sell our house in UK (which we still have to empty), my neice recovering from a bone marrow transplant for her leukaemia, having one of my step-sons to stay at the start of the week and trying to get the business established. Of course all the other things were unseen in the planning stages! I'm not complaining about any of it but it's been a demanding time! One thing I do regret is not taking my camera to a craft evening I did at the local campsite on Thursday: Had a great time making cards with a mixed group of children and adults. Anyway, all the above made it extra special to receive comments on my blog and especially this award from both Donna and Heather (who also has candy here) . The rules that go with this award are: 1. You must nominate only 5 people. 2. Four of those people are to be dedicated followers of my blog. 3. The fifth person is someone new or relatively new to my blog and should live in another part of the world. 4. You must link back to the person who gave you the award. Now this is the difficult bit...who do I choose... I'll edit tomorrow with the choices, and some cards I made today. so you can have a peek as long as you let me win! Ha ha! 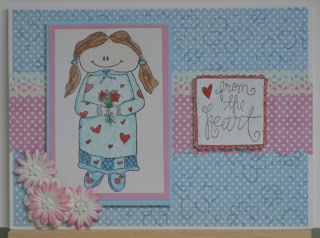 I set this week's Funky Fairy challenge: Stitching - Real or Faux. That gives lots of scope for cards or other great projects. The DT team have made a range of things so have a look on the Funky Fairy Challenge blog: You have 2 weeks to join in and, as always, there is a fab prize. 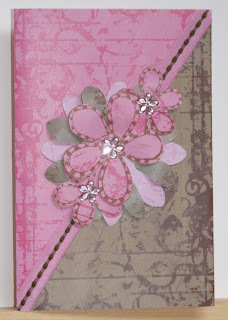 I have created this card using 'Basics' papers with stitched ribbon and the hand-stitched A5 folder using 'Funky meets Shabby Chic' with a Magnolia stamp. J'ai placé le défi challenge Funky Fairy de cette semaine : Couture- vrai ou Faux. Cela donne un bon variété pour des cartes ou d'autres grands projets. L'équipe ont fait une gamme des choses ainsi vont voir sur le blog Funky Fairy Challenge : Vous avez 2 semaines à joindre le challenge et vous pouvez gagner. J'ai créé cette carte en utilisant des papiers «Basics» avec le ruban piqué et ce classeur A5 main-piquée en utilisant des papiers «Funky meets Shabby Chic» avec un tampon de Magnolia. 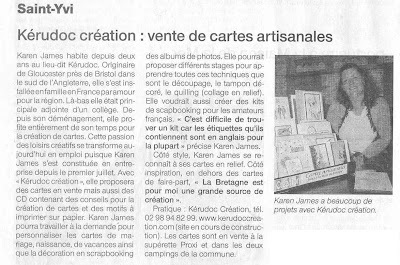 I've made the news...J'etais dans le journal ! That’s me in the local paper last Saturday: There’s lots of interest in my designs focused on the local area and its traditions. I completely forgot to share it before! Here's another card using one of the new Funky Fairy releases 'Funky meets Shabby Chic' and this time on a Page Maps sketch from June. 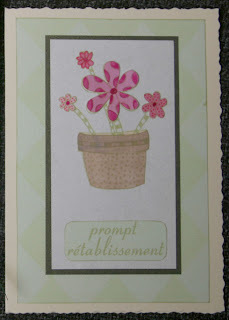 Voici une carte qui utilise les papiers nouveaux ‘Funky meets Shabby Chic ‘ avec un sketch de ‘Page Maps’ de juin. Thank you for joining in and all your kind wishes. They really are appreciated. 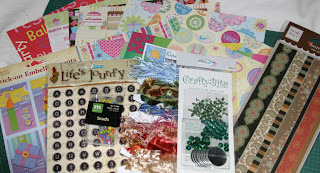 The candy is now in the post to lucky winner Crafty Treasures. The reason for the candy? I have set-up my own company, Kerudoc Création, and officially become a self-employed crafter and designer as of today! Regulations here in France mean it is illegal for me to sell to shops and even restricts how many craft fairs etc I can do without setting up a business so here I am with my cards now on display in the local shops and orders rolling in! Everything I wanted to get done is behind schedule so I will keep adding to the news and show you some designs as time and events allow! The 3 papers are from my Winter / Hiver CD collection found in my eBay shop here. 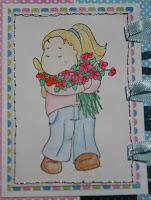 The images and sentiments are from Stampin' Up and coloured with water-colour pencils. Firstly, thanks for all the nice comments on my blog and starting up my own business: It's certainly been a busy start esp as my sister has been over to stay for the last few days. 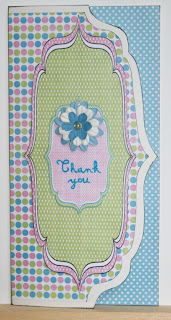 I made a few cards earlier in the week but haven't had a chance to blog until today. We also went to see the first stage of the Tour de France cycling near here last Saturday and are going to the Brest 2008 shipping festival tomorrow: Lots of photos to scrapbook when I get a chance! 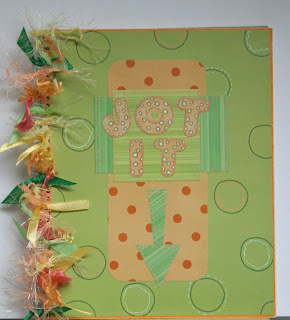 This card is following the sketch on Poetic Artistry - Mojo Monday using Funky Fairies new Shabby Chic papers. I really love both the new collections. And don't miss a look at the Funky Fairy Inspiration blog at the previewed "Moo've Me" stamp: She's a saucy moo and if you make a card in the same theme you have a chance of winning her before the launch date! I have started posting candy alerts on the right side of my blog so check there for the latest (that I know of) ! 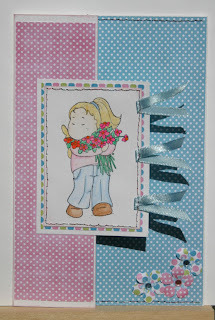 Worthy of note are the High Hopes Stamps candy and this one by Claudia for LOTS of Magnolia images. And just discovered Fran's great blog and candy here. Before I got my hands on the scrummy papers below, and before we started the kids challenge blog for Tiny Funky Fairies and Elves (whose challenge continues for another week), I made these cards for the Funky Fairy Challenge which starts today and runs for 2 weeks: That will be the pattern from now on so the big kids and the tinys get their challenges set alternate weeks. First card made using Funky Fairy Colourful Daze and second card using Funky Fairy Doodles for Daniel stamp paper-pieced with Basics papers. 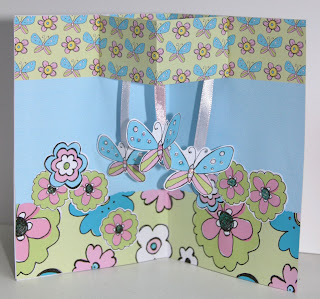 NEW Funky Fairy Paper Sets !!! 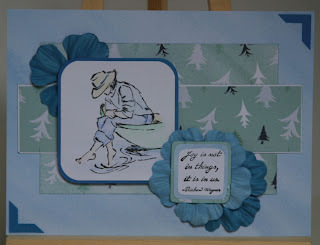 I've been sitting on my hands to hide these papers but all can be revealed...Have a look at the new papers Funky Fairy has brought out here. 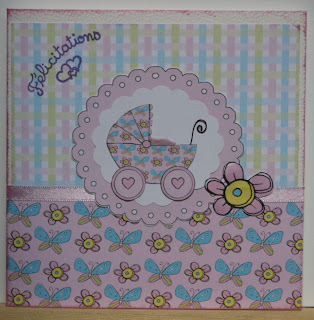 There are 2 totally gorgeous and co-ordinating sets: Funky's Garden and Funky Meets Shabby Chic. There is so much in them I have only played with a fraction so far but here are my first few cards: The pram is my own design and the stamp from elsewhere (?) but everything else above is from 'Funky's Garden' download. Another card from Jack, age 7, for the Tiny Funky Fairies & Elves 'Colours of the Rainbow' Challenge. Just in case you're wondering it's a disco ball! On the very shiny oil-on-water type paper it is quite bling! 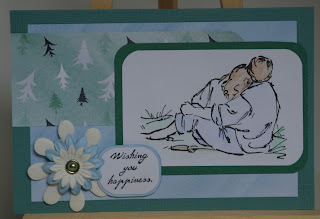 He used his little craft kit and the only input from me was to supply a card blank. 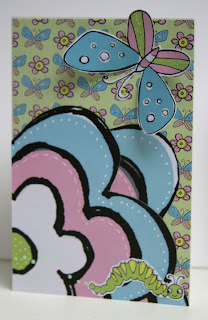 Another sneak peek of the new stamps is on Funky Fairy's Inspirations Blog ! Ellarina is gorgeous and you have a chance to win her, before the release date, just by creating something that is dancing themed so please go have a look. There is also a kids challenge running on the Tiny Funky Fairies and Elves and there'll be a new challenge for us big kids on the challenge blog on Monday! Nicki has had an awesome 10000 hits in 4 months on her blog ! WTG ! and so has Michelle on Donkey Smiles ! Also big Happy Birthday to ScrapMetal who is offering candy to help celebrate.